Legend has it that this 1921 Model Dodge Touring car (#573551) was specially built by the Dodge Brothers Motor Company for The Maharajah of Bradesh, Maharish Vjain, ruler of the tiny kingdom of Bradesh in India. Outfitted to be used as a hunting vehicle, The Dodge Bradesh, as it was called, was shipped to India via steamboat. The car arrived in Bombay on September 4, 1920 and was transferred to a rail car for the long journey to the kingdom of Bradesh. The Maharajah eagerly awaited the arrival of his Dodge hunting vehicle from the United States. To his dismay; however, he never saw the car. A Keraubi bandit tribe raided the train and stripped the Dodge of much of its special equipment, including a lookout chair, gun harnesses, and other hunting accessories. When the bandits fled, the wounded train crew returned to Bombay. There the Dodge was unloaded and placed in storage, where it was all but forgotten. Years later, in 1947, when the last of the British were leaving India, the car was discovered in a government warehouse by Sir Reginold Beecham. 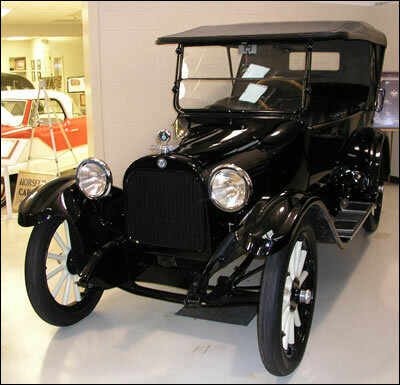 Sir Reginold purchased the car and shipped it to the United States. It was to be a gift for his American wife-to-be. Unfortunately, she did not appreciate the gift; and when she left the United States for England, the car once again went into storage. There it remained unused and virtually untouched for another twenty-two years. In 1969, the Dodge Bradesh was part of an estate liquidation in up-state New York. It was purchased by a vintage car collector and has remained in the hands of collectors to this day. Considering the car’s limited use, it is fairly certain the 30,000 miles showing on the odometer is the correct mileage. Restoration of the Bradesh Dodge was completed in 2003 by Swope Auto Center technicians.